We all knew there would be complications around Apple's decision to remove the headphone jack on the iPhone 7 and 7 Plus. 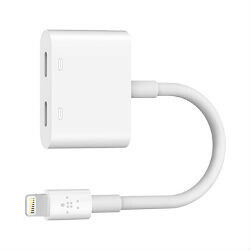 Aside from the need to use an adapter to get your old 3.5mm headphones connected to your new iPhone, there's also the issue that once you're using wired headphones you won't be able to charge your phone without yet another adapter. The first option to let you do just that is coming from Belkin with the Lightning Audio + Charge RockStar. The dongle is fairly simple affair, like any splitter you might expect -- one Lightning plug that goes in your phone and two ports so you can plug in both headphones and your charger. Belkin claims it worked closely with Apple to develop the adapter, and it's expected that Apple could end up carrying the adapter in stores. The adapter will let you do everything you might want, including charging your device as fast as it can, as well as supporting 48 kHz, 24-bit audio output, and remote controls and mic. But, the best part of all of it? It'll cost you $40 for the adapter. Yep, $40 just to have the ability to charge your phone and use wired headphones at the same time. That's progress, right? Reality: 40% faster CPU 50% more RAM 100% more base storage (16GB tier is now 32GB) (like everyone's been asking for) 100% more mid-tier storage (64GB tier is now 128GB) 100% more top-tier storage (128GB tier is now 256GB) Smaller phone now has OIS Larger phone now has dual lenses (wide vs telephoto) Larger phone will get software update later this year that adds post processed DoF effects Both phones get quad-led flash that's 50% brighter with more temperature "steps" inbetween Both phones get improved HD front facing camera Both phones get a wider f1.8 aperature Both phones get IP67 waterproofing like everyone's been asking for Both phones get wider color gamut Both phones get 25% brighter screens Both phones now have a fully pressure sensitive and programmable home button Both phones now come in two new colors (five total) Both phone now hide the antenna lines that everyone complained about Smaller phone gets 2hr battery life improvement Larger phone gets 1hr battery life improvement Neither phone shrunk and sacrificed battery life like everyone complains about, they actually stayed the same and increased battery life Both phones get stereo speakers that are 2x louder than 6s (which was already one of the loudest on the market) like everyone has been asking for Both phones get 450 Mbps LTE potential with up to 25 LTE bands Both phones are lighter than the last models NFC payment support added for Japan You can now delete stock apps in ios10 (like everyone has been asking for) Response from people who won't buy an iPhone, nor would consider getting one: OMG THERE'S NO HEADPHONE JACK!!!!!!!!!! What's funny is that almost everyone I see in public using their iphone for music uses the stock white apple earbuds. The iphone 7/7 plus both still include the white earbuds, but the new ones obviously come with a lightning plug on the end. For the peopel who use 3rd party headphones, they included a free 3.5mm to lightning adapter. As for charging AND listening, belkin makes an adapter, but with 60 hrs of music playback time on the 7 plus and 40 hrs on the 7, even if you play music back for 24 hrs straight, you'd stil have battery left at the end of the day. Not really a problem for 99% of the people. But hey, this is exactly how everyone reacted when Apple released the 12" Macbook with a single USB-C port. And despite the doom and gloom, it ended up being a top selling laptop that is probably the only reason Apple was the only PC manufacturer in 2015 that had a significant increase in sales. (everyone else declined, and ASUS stayed about even) This is also how people reacted when Apple made the battery built-in for their laptops and phones. But now it's normal for almost every laptop/phone now. I could go on and on, but people are ridiculous. That jack will not be missed by me. By the way: WHERE WAS THE OUTRAGE. WHEN. MOTOROLA. DID. IT. Sorry, let me correct something: iOS will not fully uninstall pre-installed apps but disable/hidden and delete apps data only. Android doesn't do this either, so who are you going to compare this to? Yes it does, there are apps for that on the Play Store. Whats the point of an iris scanner for yourself if youre as blind as a bat? Eveything in the competition is useless for him (and for most iFans) untill Apple implements it in the iPhone. Sad story, bruh. If you are blind then what do you need a smartphone for? Dude! You channeled techiexp with this one! Lmao! Your comment was longer than the article! Something had to be said.. People are over reacting when the truth is that Apple delivered an amazing device. The denial syndrome (as some clown on here calls it) is kicking in hard. They delivered a "good" product. Not sure if I would call it amazing. Some ASPECTS of it was amazing, like the camera (on the 7 plus) and the SoC, and I like the stereo speakers, but that's all as far as I'm concerned. And I totally don't agree with the removal of the 3.5mm headset jack. But then again, I don't agree with sealed batteries and non-removal storage either, even though the latter has its advantages. I just think that Apple could have added more that would have made it amazing. Everything apple does is amazing to you. The irony on how you react to "those" people when apple is being criticised. That is just the thing... you call it amazing but to anyone else that has some other flagship from another manufacturer it appears like Apple didn't hit a homerun here. The competition has come up since Apple's hayday... they just are not really that interesting anymore. Is it still amazing if everyone is doing it! Apple's version of TechieXP? Actually there was a lot of complaints when Motorola did it. Still HD screen on the 4.7in model and only 1080p for the plus. The design is so old I wouldn't be caught dead with one. Those huge bezels are soo 2008! Also, phone is 25% more expensive. Accessories get 50% inflated price. "What's funny is that almost everyone I see in public using their iphone for music uses the stock white apple earbuds." Because, most people out there think, earbuds supplied by Apple with the iPhone is the best there is! This is not a joke, even a thing, such as this, contribute to the show off factor! I've known such people, boasting about the earbuds from Apple! Totally agree. I know people who have done the same exact thing. Now everyone starts eating same meal with other people every time. Facts are facts. Get over it. The problem is other brand users prefer Apple's earbuds too when listening to music on their phones. Not because they are so good but because thei are better than those embedded with other phones. Really? So you mean they go ahead and buy earpods separately for listening to music or whatever when lots of better products are available for that price? That can't be true!